Yes it is color! In fact it is 4 a color print, all tints, tones and shades of alirizon crimson. I have done probably a half dozen multi color engravings. This is the last I have available and probably the last I will ever do. They are just too difficult and time consuming and I truthfully prefer the black and white. 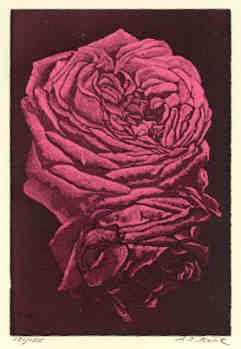 Printed in an edition of 125. Image size 3.5"x5". Mat size 8"x10"